Dr Val Noone next to the Famine Rock at Williamstown. The famine monument at Williamstown in suburban Melbourne will host this year’s International Commemoration of the Great Famine, the Irish Government has announced. It is the first time Melbourne has hosted the event which takes place in a different country each year. The ceremony will take place on Sunday, October 28 and Melbourne Irish Famine Commemoration Committee’s chairman Dr Val Noone said he and his team were “honoured” to be chosen. 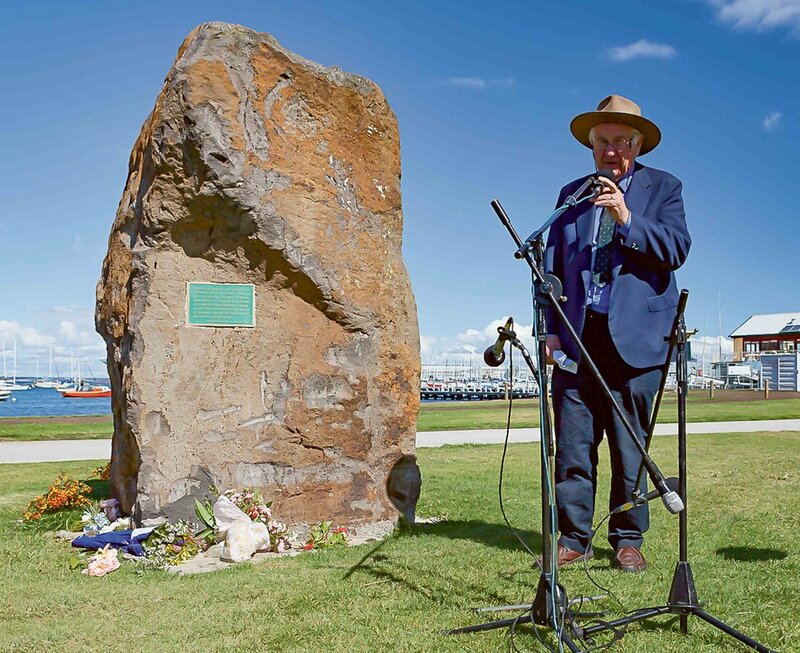 The Williamstown Famine Rock was erected 20 years ago to commemorate the 150th anniversary of the arrival of 191 Irish orphan girls into Hobson’s Bay aboard the Lady Kennaway. The impoverished girls from Irish workhouses were brought out to Australia between 1848 and 1850 to become servants and wives under the Earl Grey Emigration Scheme. Dr Noone said descendants of the orphan girls’ will attend this month’s commemoration which will also include Irish music and song, flower-laying and speeches. “We pass the microphone around and give them a chance to tell us who they are descended from, what age they were when they came, and what ship they came on,” he said. Irish Minister for Culture Josepha Madigan said some 1700 of the 4000-plus young Irish women who came to Australia under the Earl Grey scheme first landed in Melbourne. “This year’s commemoration represents an opportunity to not only honour the work of the Irish community in Melbourne in preserving its history but also to pay special tribute to the memory of those young women and their contribution to their adopted homeland,” she said. Sadly when the girls first arrived, some of the local press whipped up anti-Irish feeling. The Melbourne Argus newspaper was particularly harsh, describing them as “ignorant creatures, whose knowledge of household duty barely reaches to distinguishing the inside from the outside of a potato”. Dr Noone said they would have needed “courage and determination” to deal with the discrimination, prejudice and racism they encountered. “It is moving to think that those girls, scorned and libelled by the local press when they arrived, are being remembered and honoured,” he said. Irish studies Professor Elizabeth Malcolm is a great-great granddaughter of Margaret Cooke from Co Kildare who came to Australia on the Earl Grey scheme when she was just 16. Dr Noone said they’d been having annual community commemorations at Williamstown since the memorial was first erected 20 years ago.